Movie and TV-themed slots are something Blueprint Gaming have dipped into before with the likes of Deal of No Deal – What’s In Your Box, Austin Powers, Top Cat, and this year’s Naked Gun. And the creatives must have been rubbing their hands with glee when it was announced that Blueprint had signed a deal to build a slot based on the hilarious film, Ted Slot, starring Seth Macfarlane (Family Guy) and Mark Wharlburg. Both Ted films which tell the story of a boy who grew up with a particularly rude and funny talking Teddy Bear who lives with him and his girlfriend, were smash hits at the box office. So, it’s no surprise that Blueprint have turned them into a blockbuster slot, utilising Ted and his catchphrases to build some brilliant features. The whole game is bursting with them – six that randomly trigger in the base game, and another five that trigger when specific symbols fall. There are wilds, stacked reels and free spins galore, plus some great dialogue from Ted himself. Blueprint Gaming’s Ted Slot is a 5 reel and 20 payline slot game that pays out at a medium variance. The features and payouts our regular, but bigger wins need to be sought out in the harder bonus rounds. Ted RTP is 95.8%. You can play the game on mobile, desktop or tablet, and for free of for real. 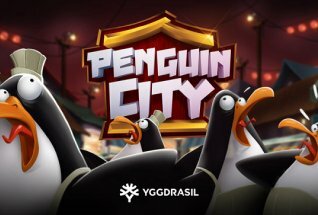 Try it today at one of our favourite sites, VideoSlots.com, or read on for our full review of the game and its 11 features! The backdrop of the game is Ted’s apartment, with the couch and empty beer cans surrounding a sleeping bear. At various points in the game Ted leaps up to stand beside the reel and reel off catchphrases from the film. The symbols are the standard cards, Jack, Queen, King and Ace, as well as the higher value symbols – a bong, ducks, a crate of beers, and Ted’s girlfriend. There is also Ted himself who doubles up as the Wild symbol to substitute for all others bar the scatter. Land 5 of him on a payline for a 500x stake payout. You can play Ted Slot from 20p up to £200 per spin, and the paylines are fixed at 20. There is also an Autoplay function allowing you to play up to 100 spins hands free, or up to a maximum loss limit in a session, or a single win limit. The sounds can be toggled on or off, but what would Ted Slot be without the sounds, right? Laser Gun Wilds: Ted fires a laser at the reels, turning random symbols wild. Pyschedelic Super Spin: Ted blows smoke onto the reels, turning some symbols into identical ones to create wininng lines. Beer Streak: Ted sprays beer over a winning payline, causing symbols to change and shuffle and create new wins. Psychedelic Colossal: Again, Ted blows smoke on the reels. This time when the smoke clears, 3 reels combine to form one massive reel to create a colossal symbol wining combo. TV Remote Symbol Streak: After a win, Ted hits the remote and your winning symbols stick whilst the rest of the reels spin, causing more wins. 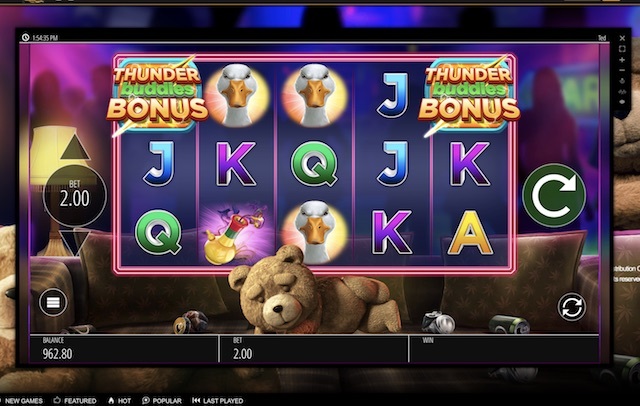 Psychdelic Bonus Boost: Ted breathes smoke onto the reels, adding more bonus symbols and bringing better odds of landing the Thunder Buddies Bonus. Now, if you hit 3 or more Thunder Buddy Bonus symbols in the base game, you trigger the bonus round. There are five possible features, and which you play depends on the spin of wheel at the start of the feature. Wheel of Fartune: This consist of a wheel that spins to bring multipliers, re-spins and a direct jump to the Big Money Bonus Feature. Bar Crawl: This is a board that you move around by choosing bottles that reveal how many places you move with each go. 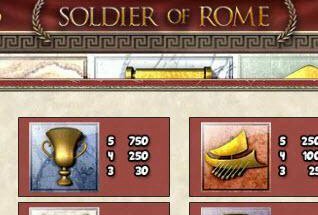 You pick up multipliers on the way. There are also special board positions that can get you into the Big Money Bonus Feature, or further cash prizes. Don’t get arrested though, or the feature ends. Super Mart Free Spins: Five Free Spins, whilst meanwhile Ted runs behind the reels handing out extra Wilds. Flash Free Spins: Play for cash prizes, more Free Spins and access to the Big Money Bonus round. With each spin a grid above the reels denotes the prizes you have won. Big Money Bonus Feature: Ted sits next to a carousel that reveals multiplier values. Keep collecting more and receive up to 500x your stake. 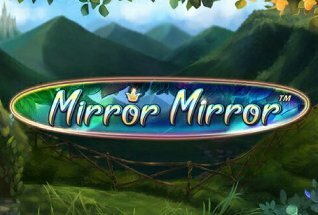 By picking a Sale sign at the edge of the screen, either you trigger another chance to collect more multipliers, or you collect what’s in the pot. This will go down as one of the best releases of 2017. The Ted films are a rich source of entertainment and they lend themselves beautifully to the slot format. The sounds clips and animations of Ted are hilarious, and the huge list of features means you won’t have a dull moment playing this game. Ted Slot is a must play – give it a spin now.